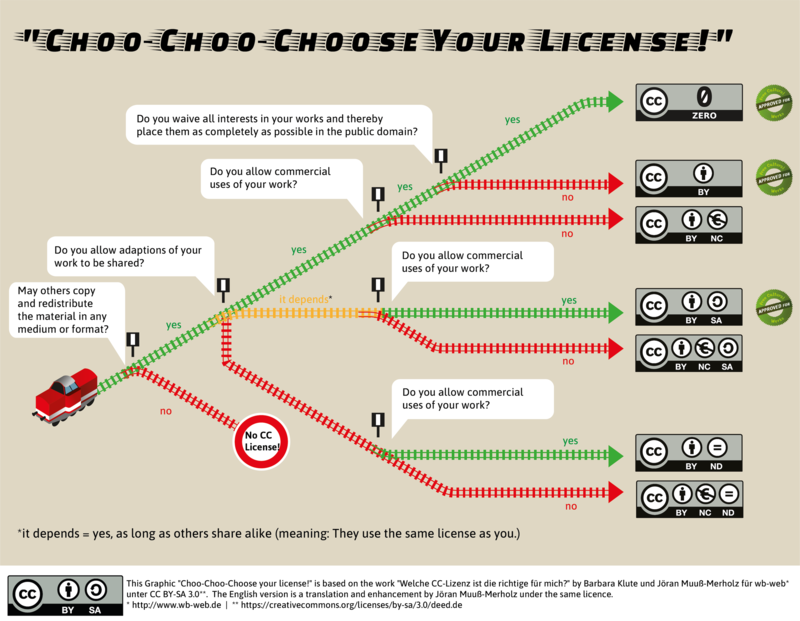 This infographic on Creative Commons licences illustrates your choices when you want to publish your own work under a CC license. Start with the locomotive on the left and make your choices at each switch. The graphic itself is published under CC BY SA 3.0 and can be downloaded here. I made the German version in 2015 together with graphic designer Barbara Klute, commissioned and published by wb-web. Thanks to the CC licence the graphic has spread quickly and widely on the web and on slides. The new title “Choo-Choo-Choose your license!” was inspired by the words read by Ralph Wiggum. Thanks a lot for this clear and educational infographic. It seems to me that there is a small mistake: the beginning of the second red path – leading to CC By-SA and By-NC-SA licenses – should be orange, like the one above, with the same caption (“it depends”).